ww2dbaseRobert Greim was born to a Bavarian police captain. During WW1, he served in the German artillery and later, in 1915, transferred to the air service. After achieving 8 aerial kills as a fighter pilot, he was named the commanding officer of Jagdgruppe 10 and later Jagdgruppe 9. He would achieve a total of 28 kills when the war ended. He was awarded the Pour le Mérite medal in Oct 1918 and at the same time was awarded the Military Order of Max Joseph; the latter made him a knight (Ritter) and allowed him to add the style "von" to his name. During the inter-war years, Robert von Greim was unable to remain in the small German military, thus he planned to change his career by studying law. Before he became established as an attorney, however, he was invited by the Republic of China to modernize the Chinese Air Force. In China, he founded a flying school despite his belief that Chinese people made poor pilots. As the Nazi party gained influence, he returned to Germany. In 1933, he was asked by Hermann Göring to build the German Air Force, and readily accepted. In 1934, he was made the commandant of Luftwaffe's first fighter pilot school. 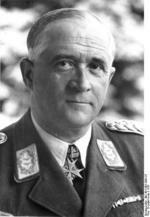 In 1938, he was given command of the Luftwaffe department of research at the rank of Generalmajor. Later in the same year, he was made the commanding officer of Jagdgeschwader 132 "Richthofen". When the European War began in 1939, he was made a commanding officer at the Luftflotte level and played a role in the invasion of Poland, Norway, Soviet Union, as well as the Battle of Britain. In the Battle of Kursk, his personal involvement in the deployment of ground support missions won him Oak Leaves to his the Knight's Cross of the Iron Cross medal. On 25 Apr 1945, Generaloberst Greim flew into enveloped German capital of Berlin as a passenger in a Fw 190 fighter, and then flew from Gatow toward the Channcellery in a Storch aircraft; the Storch aircraft was damaged by anti-aircraft fire, causing a wound to Greim's right foot, but his mistress Hanna Reitsch was able to land in the Tiergarten. After seeing Adolf Hitler, he was promoted to the rank of Generalfeldmarschall (Field Marshal) and was given command of the Luftwaffe; he was the last German officer to be promoted to that rank and would become the last commanding officer of the Luftwaffe. He left Berlin on 28 Apr on Hitler's orders. He was captured in Austria by US soldiers on 8 May. As he was to be transferred to the Soviets, fearing torture, he committed suicide less than a month later. He was buried at a community cemetery in Salzburg, Austria. 22 Jun 1892 Robert Greim was born in Bayreuth, Germany. 7 Jan 1912 Robert Greim was promoted to the rank of Fähnrich. 25 Oct 1913 Robert Greim was promoted to the rank of Leutnant. 26 Nov 1914 Robert Greim was awarded the Iron Cross 2nd Class medal. 10 Oct 1915 Robert Greim achieved his first kill as an observation plane pilot over France and was awarded the Iron Cross 1st Class medal. 17 Jan 1917 Robert Greim was promoted to the rank of Oberleutnant. 25 May 1917 Robert Greim achieved his first kill as a fighter pilot over France. 16 Aug 1917 Robert Greim achieved ace status while fighting in France. 16 Oct 1917 Robert Greim achieved his 7th kill over France. 11 Feb 1918 Robert Greim claimed a kill in aerial combat over France but it was not confirmed. 18 Feb 1918 Robert Greim achieved his 8th kill over France. 21 Mar 1918 Robert Greim achieved his 9th kill over France. 29 Apr 1918 Robert Greim was awarded the Knight's Cross of the Royal House Order of Hohenzollern with Swords medal. 18 Jun 1918 Robert Greim achieved his 15th kill over France. 7 Aug 1918 Robert Greim was named the commanding officer of Jagdgruppe 9 and achieved his 16th kill over France. 27 Sep 1918 Robert Greim achieved his 25th kill over France. 14 Oct 1918 Robert Greim was awarded the Pour le Mérite medal. 23 Oct 1918 Robert Greim was awarded the Military Order of Max Joseph, which added the honorific Ritter and the style von to his name, ie. Robert Ritter von Greim. 15 Feb 1921 Robert von Greim was promoted to the rank of Hauptmann. 1 Jan 1934 Robert von Greim was promoted to the rank of Major. 1 Sep 1935 Robert von Greim was promoted to the rank of Oberstleutnant. 20 Apr 1936 Robert von Greim was promoted to the rank of Oberst. 1 Feb 1938 Robert von Greim was promoted to the rank of Generalmajor. 1 Jan 1940 Robert von Greim was promoted to the rank of Generalleutnant. 20 Jun 1940 Robert von Greim was mentioned in the Wehrmachtbericht radio report. 24 Jun 1940 Robert von Greim was awarded the Knight's Cross of the Iron Cross medal. 19 Jul 1940 Robert von Greim was promoted to the rank of General der Flieger. 22 Nov 1941 Robert von Greim was mentioned in the Wehrmachtbericht radio report. 19 Jan 1942 Robert von Greim was mentioned in the Wehrmachtbericht radio report. 16 Feb 1943 Robert von Greim was promoted to the rank of Generaloberst. 2 Apr 1943 Robert von Greim was awarded Oak Leaves to his Knight's Cross of the Iron Cross medal. 3 Sep 1943 Robert von Greim was mentioned in the Wehrmachtbericht radio report. 28 Aug 1944 Robert von Greim was awarded Swords to his Knight's Cross of the Iron Cross medal. 9 Sep 1944 Robert von Greim was mentioned in the Wehrmachtbericht radio report. 31 Oct 1944 Robert von Greim was mentioned in the Wehrmachtbericht radio report. 17 Apr 1945 Robert von Greim was awarded the Combined Pilots-Observation Badge in Gold with Diamonds. 25 Apr 1945 Robert von Greim arrived at Gatow, Berlin, Germany. 26 Apr 1945 At Adolf Hitler's bunker in Berlin, Germany, Generaloberst Robert Ritter von Greim was promoted to the rank of Generalfeldmarschall and was named by Hitler as Hermann Göring's replacement. 28 Apr 1945 Robert von Greim departed Berlin, Germany. 8 May 1945 Field Marshal Robert Ritter von Greim, Head of the Luftwaffe since Hitler's dismissal of Hermann Göring in the last days of the collapsing German Reich, was captured by the Americans in Austria. 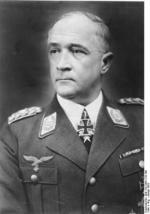 24 May 1945 At Salzburg, Austria, Field Marshal Robert Ritter von Greim, head of the Luftwaffe, committed suicide in American captivity. Having learnt that he was to be a part of a Soviet-American prisoner exchange and, fearing torture and execution at the hands of the Russians, he took cyanide. His final words were: "I am the head of the Luftwaffe, but have no Luftwaffe." First- Hanna Reitsch was not his mistress. This is post-war gossip. And second- his destruction of a British tank from the air (along with Vfw Putz) in 1918 is the reason for his Max Joseph Orden medal and the honorific "von".